Brief Synopsis – A veteran University Basketball Coach much navigate the murky ethical waters when trying to recruit new players for his team. My Take on it – Sometimes movies have a great premise, but just don’t know how to deliver them properly. This movie is a perfect example of that; the idea of having a coach with a conscience try to decide what is more important to him is done well. Nick Nolte was a great choice for the lead role, because he knows well how to play the kind of character that can blow up in a second, but also give off enough confidence that he knows what he’s doing. Unfortunately, there is no real chemistry between Nolte and Mary McDonnell, (who plays his ex-wife who is still his best friend) and their relationship here brings forth more questions than answers because they just don’t mesh together well enough. All in all, this movie feels too generic and although it tries to tackle an important issue, it falls flat too quickly and doesn’t recover. Bottom Line – Interesting idea, but come across as too generic and doesn’t really hit as hard as it should. Nolte is good as the coach who likes to do things his way. The chemistry between McDonnell and Nolte is bland and it’s hard to believe their relationship. Good review. You make some good points about the relationship with Nolte’s exwife. However, this was all about Shaq. 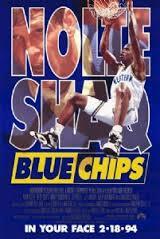 It’s one of my fav basketball films. You’re right about Nolte. He’s great as the coach. if you’re a sports fan, this is a must watch. For younger fans, it will be extra compelling to see the myth of young Shaq getting recruited and playing college ball. While not as good as Hoosiers, it’s up there. Thanks for walking me down memory lane with this article, Rob!